This is one of those dishes that requires crusty bread to mop up the sauce. It is originally from Cook's Illustrated, but since they don't publish their recipes on the web, and I don't subscribe to the magazine, I took it from Angela's Food Love, who made it her own by making an orange zest gremolata instead of lemon and adding some of her own flair to the recipe. Therefore, I am calling it Angela's recipe (BTW, where are you Angela? I haven't seen a post in a while). Gremolata is traditionally a topping for osso buco, made w/ lemon zest and parsley. Here, it's the orange zest that gives this dish a new twist (I sound like a salesperson). I am normally against using boneless, skinless anything, but here, I was thankful that I didn't have a mess on the stove from frying all that chicken. I changed the recipe a little bit, adding less or more of this or that. 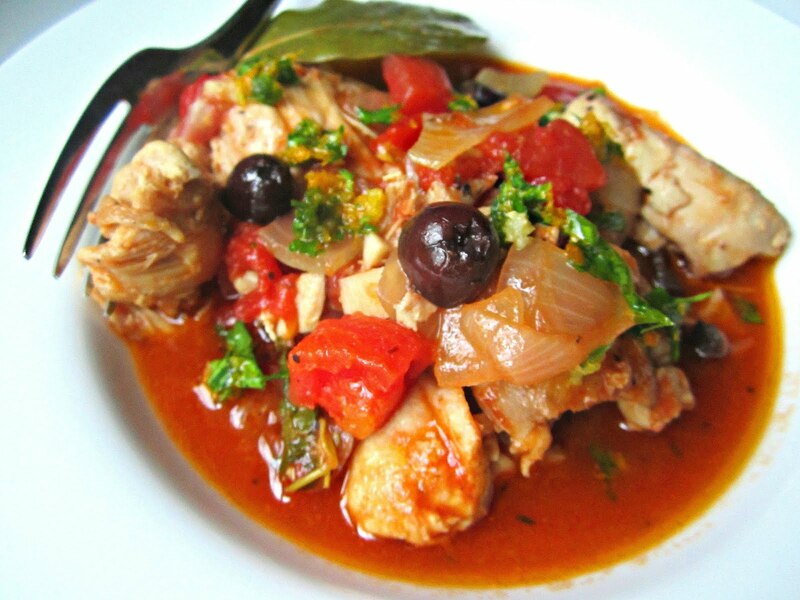 This is a perfect company dish, because it can be made ahead, and reheated just before serving. 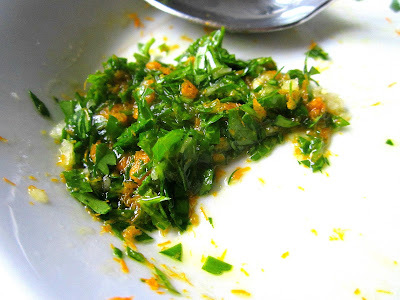 Make the gremolata by combining the ingredients in a small ramekin and set aside. You will use this to top the chicken with. Season the chicken thighs w/ kosher salt & pepper on both sides. Heat some olive oil in a large heavy skillet and cook the thighs for about 4 minutes on each side. Since they are skinless, I always find that they stick a little to the pan, just use a fish spatula to turn them. Remove chicken from pan and set aside. In the same pan, heat the onions for 2 minutes, then throw in the garlic and anchovy and cook about 3 minutes on medium heat. Add the cup of white wine and turn up the heat. Deglaze the pan, scraping up the brown bits and pieces of chicken left in the skillet, with a wooden spoon. 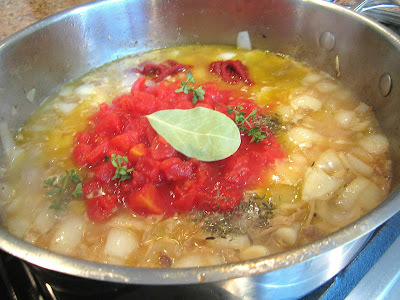 Now add the chicken stock, tomatoes, olives, bay leaf, tomato paste, 1 tbsp of orange zest, cayenne and thyme and bring to a boil. Add the chicken pieces back in the skillet and place the lid on. Simmer this for 25 minutes. The sauce should be reduced a bit, and thicker in consistency. Spoon pieces of chicken into shallow bowls and ladle the sauce on top. 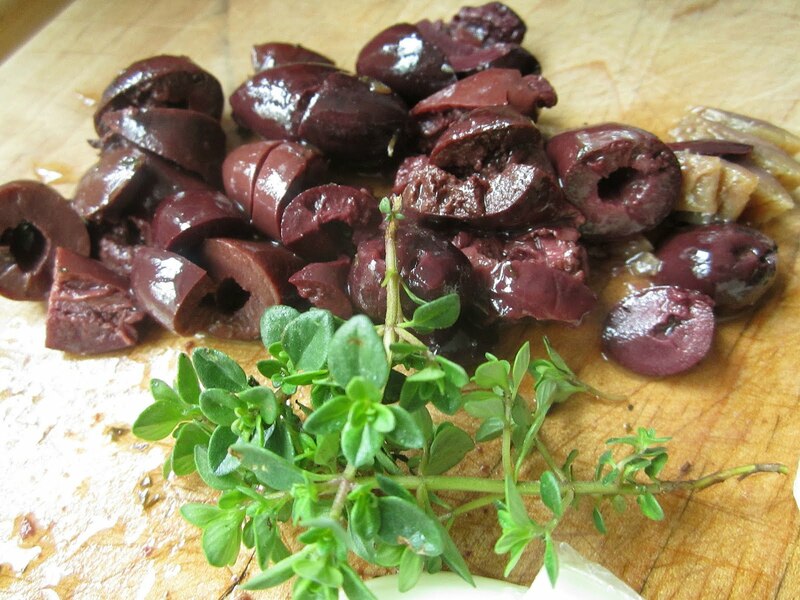 Garnish with the gorgeous gremolata and serve with pieces of crusty bread. Yes, a big huge chunk of crusty bread! 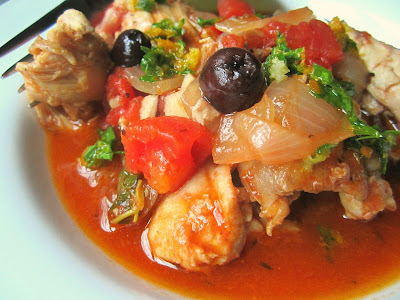 This recipe/photo is Proud Italian Cook style red/green scrumptious. That Cook's Illustrated dude knots his bowtie a bit too tight, dontcha think? I agree about Cooks Illustrated. I think their recipes are decent, basic and good, but what is the big deal about sharing? I subscribe to all the cooking mags except theirs for that reason. WOW that looks amazing. I have never made Gremolata before, never heard of it before in fact. But it looks like it would add such a nice fresh taste to this dish. You have inspired me! I like your's and Angela's twist to this recipe. This looks so delicious! I will try this version on a weekend, sounds like a winner. Why in the world can it not just be, salt? or mineral rich salt. Why does it have to be kosher? It is pointless...... except to sell an agenda. there is a big difference in iodized salt vs. kosher salt and sea salt. It has nothing to do with religious views and not sure why you have a problem with the term. Kosher salt was used years ago to "kosher" a chicken, the large granules CLEAN the bird, that's why kosher birds 9which are kosher due to dietary religious reasons) are saltier in taste and cleaner. Sea salt is wet and from the sea, an dnice to sprinkle on top of things, which I use a lot. I use a pinch of Morton's IODIZED salt (which is very salty in taste) in baking only. You can read all about the different types of salts and their uses if you google it. It's not rocket science. Obviously, Anonymous has their OWN AGENDA with the term "kosher". It's been called KOSHER SALT since the 1800's, if you have a problem with the name, then look for something that says mineral salt. Who's the funny anonymous person, not the "Kosher Complainer"! I love all your food no matter what salt you put on it!